Microgrid implementation and project challenges vary according to requirements and economic and business drivers, but on a broader level can be developed using a common approach. Microgrid technologies and solutions are already available, reliable and efficient, and there are many examples of successful implementations. However, microgrids’ rapid and large dissemination still faces challenges, which could be related to the struggle in managing projects that involve new actors, with new business models, new functional demands, and technical constraints. The answer for improvement includes the use of new tools and a precise methodology for sizing the microgrid, conducting specific design calculations, and studies toward an efficient implementation. Microgrids generally include a mix of power generation, storage and static conversion technologies. The challenge is to ensure stable conditions with not only rotating inertia given by traditional generators, but also PV, wind and Electrical Energy Storage System (EESS) static converters. 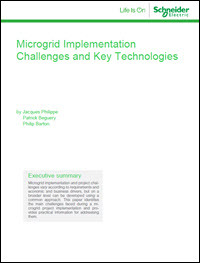 Download the Schneider Electric white paper that identifies the main challenges faced during a microgrid implementation and provides practical information for addressing them.